As the Gilded Age comes to a close, Elena Bissette's once-wealthy family has nearly lost its fortune. The Bissettes still own a home on fashionable Mackinac Island, where they will spend one last summer in the hope of introducing Elena to a wealthy suitor. But Elena is repulsed by the idea of marrying for money. Quickly tiring of the extravagant balls, Elena spends most evenings escaping back into Mackinac's rugged forest. There she meets Chase, a handsome laborer who shares her love for the night sky. The two begin to meet in secret at an abandoned lighthouse, where they work together to solve a mystery buried in the pages of a tattered diary. As Elena falls in love with Chase, her mother relentlessly contrives to introduce her to Chester Darrington, the island's most eligible bachelor. Marriage to the elusive millionaire would solve the Bissettes' financial woes, and Elena is torn between duty and love. 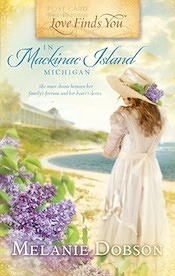 When I first saw that Melanie Dobson had a new book out, taking place on Mackinac Island, I had so hoped I would get on this tour. I grew up in Michigan and have been to Mackinac Island several times growing up. What fun to have the story take place in a location I have visited like that and can picture! Steeped in history, this story leads Elena in a choice between taking care of her family financially, and following her heart. I love the setting of the lighthouse, the diary that has been found and the passages of it hinting of a day gone by. To find that the manservant Claude is related to one of the names in the story begins to tie the past and the present together. Melanie Dobson has written ten contemporary and historical novels including five releases in Summerside's Love Finds You series. 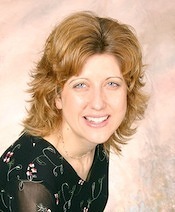 In 2011, two of her releases won Carol Awards: Love Finds You in Homestead, Iowa (for historical romance) and The Silent Order (for romantic suspense). Melanie received her undergraduate degree in journalism from Liberty University and her master's degree in communication from Regent University. Prior to her writing career, Melanie was the corporate publicity manager at Focus on the Family and a publicist for The Family Channel. She later launched her own public relations company and worked in the fields of publicity and journalism for more than fifteen years. Melanie and her family enjoy their home in the Pacific Northwest. The entire Dobson family loves to travel and hike in both the mountains and along the cliffs above the Pacific. When Melanie isn't writing or playing with her family, she enjoys exploring ghost towns and dusty back roads, line dancing, and reading inspirational fiction. Celebrate with Melanie by entering her Kindle Fire Giveaway! Signed copies of Melanie’s Love Find You books: Love Finds you in Nazareth, Pennsylvania, Love Finds You in Amana, Iowa, Love Finds You in Homestead, Iowa, and Love Finds You in Liberty, Indiana. But hurry, the giveaway ends on 8/4/12. The winner will be announced on 8/6/12 at Melanie's blog! Just click one of the icons below to enter! Tell your friends about Melanie's giveaway on FACEBOOK or TWITTER and increase your chances of winning.